Senior midfielder Victoria Boylett has started all but two games this season. After winning the last eight games, No. 11 Harvard (11-1, 3-0 Ivy League) goes into its game on Saturday against Cornell looking to set a new program record for wins in a row. The Crimson has been absolutely dominant this season, with its sole loss this season against one of the strongest teams in the nation, No. 3 Maryland. Its No.11 ranking on the Penn Monto/NFHCA Division I Coaches Poll is its highest ranking in program history. Harvard looks to build on its successes from the past two seasons where it also had winning streaks of six games or more. The Crimson also has the third highest winning percentage in the nation (.917) and is only two wins away from the program record (13). Cornell, on the other hand, has not had the most spectacular season, with a 3-8 overall record, and no conference wins. However, the series between Harvard and Big Red has always been competitive, with the Crimson holding a slim 7-6 advantage over the last 13 meetings. If Harvard is to make history and win its ninth game in a row, it cannot take Big Red for granted, and will have to bring its best efforts. Harvard’s success this season is a result of its strong defensive play and and a balanced offensive game. The Crimson averages only 0.83 team goals against, which is the third best mark in the nation while also having the tenth best scoring attack in the nation, with an average 3.25 goals per game. 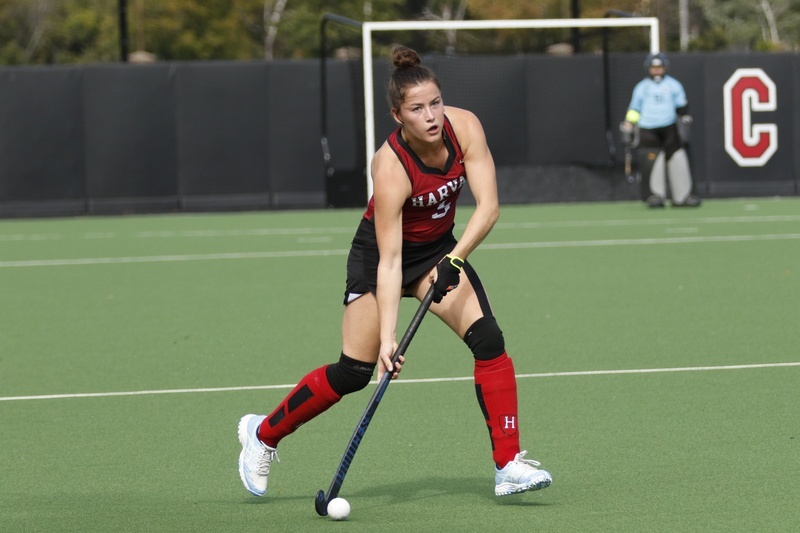 The versatility on both the defensive and offensive side has allowed Harvard to beat its opponents in dominant fashion, with six shutout victories already this season. Its offensive prowess has been spearheaded by juniors Bente Van Vlijmen (nine goals, five assists) and Maddie Earle (nine goals, two assists). Vlijmen has been on a historic run, having scored 23 points already this season, and is on pace to break the single season scoring record (42 points) held by Judy Collins ‘99 and Shelley Maasdorp ‘05. 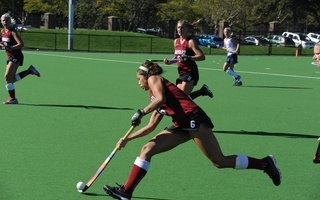 Earle has also been instrumental to Harvard’s lethal attack with seven goals in the last six games. Going into Saturday’s game against Cornell, the Crimson will have to keep up the phenomenal play from both of its veteran leaders and its underclassmen. Captain Kathleen Young proved herself in the clutch this past weekend, with a tie-breaking goal against Brown last Friday. In that same game, senior goalie Libby Manela earned the win against the Bears, and improved to 5-0 on the season. These seniors will need to have another stellar performance to ensure that Big Red does not upset Harvard at home. First year Harvard goalie Ellie Shahbo also has to maintain her outstanding contributions, having won five straight starts and only allowing two goals within that span. If both its experienced and young talent perform up to expectations this weekend, the Crimson should have no trouble securing a victory. Finally, it is critical that Harvard keeps Cornell’s top scorers in check, and continue to be aggressive with its offensive attack. 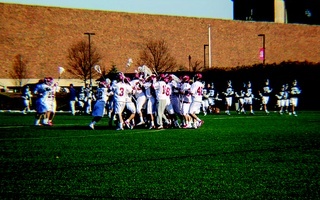 Big Red has a 83-5 record in games in which they score three goals. Inhibiting leading scorer Kristen Pienaar from feeling comfortable will be integral to stifling Cornell’s attack. It is also essential that the Crimson has momentum from the start of the game. Big Red has a 114-15 record when they score first, showing that they are a significantly stronger team with early momentum. While Harvard has proven before that they can still beat Cornell even when they score three goals, as evidenced by their 4-3 overtime victory over Big Red last year, the prevention of early scoring should be of utmost priority for the Crimson. Harvard should also keep up a strong scoring attack throughout the game in order to pester Cornell’s goalie Maddie Henry. Henry has shown her prowess with five double-digit save outings in her career, and is a goalie that is very difficult to score on. Therefore, the Crimson will need to maintain its stalwart defensive play and potent offensive attack in order to come away with a victory against Big Red this weekend. Harvard will have the chance to make history on Berylson Field, and will need this win to continue breaking records and keep up its momentum as they face some of the strongest teams in the nation. Even though sophomore attack Marisa Romeo tallied her highest point total of the season, the Crimson could not get past the Eagles. ​Familiar faces will be pitched against each other this weekend in Minnesota, as the No. 8/8 Harvard women’s ice hockey team travels to Duluth, Minn. to take on the No. -/10 University of Minnesota-Duluth Bulldogs in a pair of non-conference tilts.